SIBERIA - Novosibirsk "into the sky"
Flycom was established in year 2005 and operates under Russian Ministry of Communications license. Flycom company operates in compliance with ISO 9001 2000 and provides following services: uplink, downlink and turnaround services for television, radio and data channels; operation and integration of mobile and stationary uplink and downlink satellite systems. 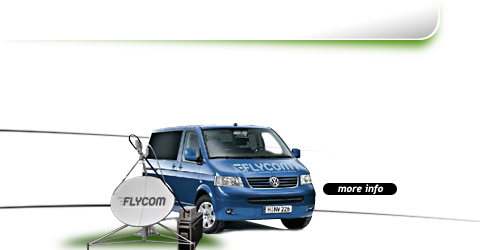 Flycom is one of the leading providers of mobile satellite transmission services. Our company possesses diversified experience in worldwide television broadcasting. Our OB van, Drive-Away, Fly-Away systems have been broadcast a major events in Russia and CIS such as breaking news, conventions, sport events and entertainment. Our mobile systems can professionally satisfy your operational and broadcasting needs. Based in the Russia, we provide fast, flexible and cost effective range of solutions and services with experienced crew, event management services and technical support. 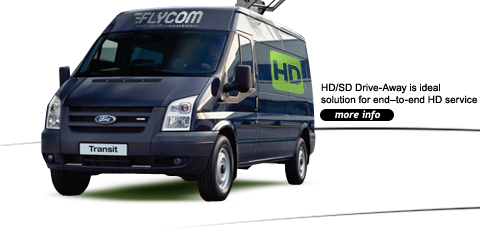 Flycom offers multi cameras mobile TV stations – OB van, HD/SD satellite uplink and downlink facilities from DriveAway and FlyAway systems for operating in Russia and CIS.